So you’re ready to get on that bike? 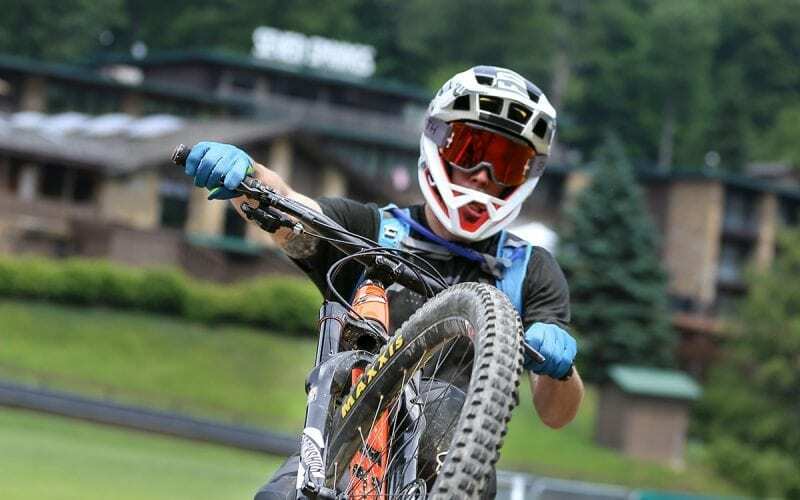 Tickets can be purchased in the Bike Center at Seven Springs located on the lower level of the Ski Lodge. Prices are subject to change and do not include applicable state and local taxes. No one under any exception under the age of 8 is permitted to ride the course. Children ages 8-11 must be accompanied by a parent or guardian at all times. Parent/guardian must also have a valid bike park ticket. Any person under the age of 18 must have parent sign Downhill Mountain Biking liability form. Open Memorial Day Weekend through Labor Day and Saturdays and Sundays, through October 20, 2019, weather permitting. Please refer to the Mountain Courier or the Summer Adventure Report for this weeks hours. Park hours subject to change based on weather and daylight. Can’t get enough of the park? The Season Pass, Super Seven or Triple Play Cards give you access to all of our incredibly rad trails any day that we are open! 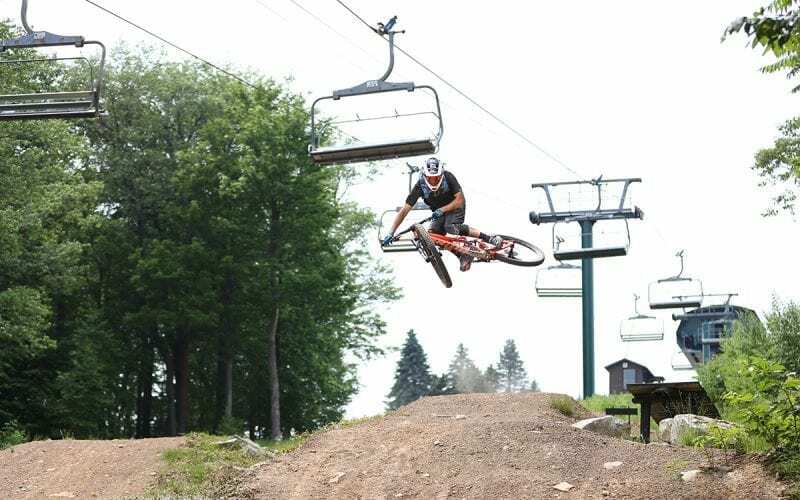 For more information about purchasing a Downhill Bike Park Season Pass, Super Seven Card or Triple Play Card, please call 800-452-2223, ext. 7491. 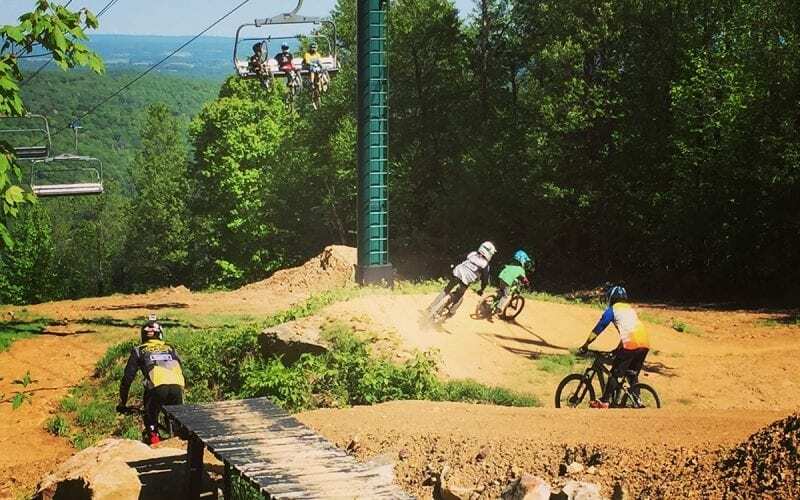 Super Seven and Triple Play Cards are valid any operating day during the 2019 Downhill Mountain Biking season. 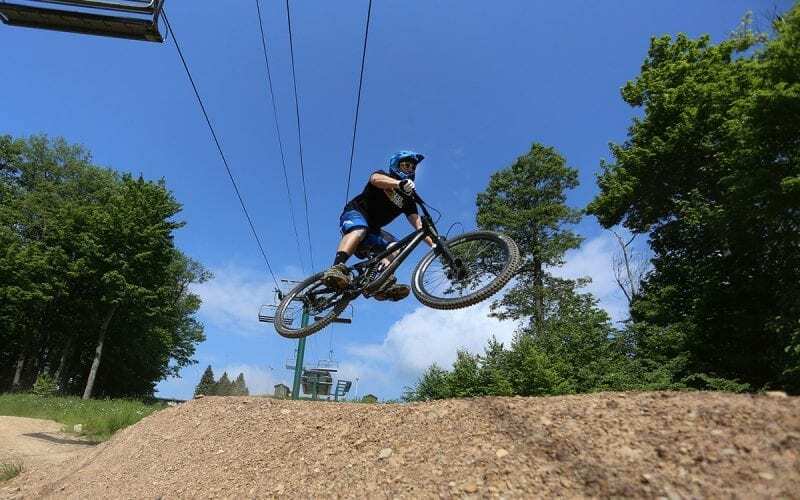 Super Seven Cards are valid for seven individual, all-day bike park tickets and Triple Play cards are valid for three individual all-day bike park tickets. Only one ticket per day may be redeemed and cannot be combined with any additional discount coupon etc. Cards can be re-loaded with additional purchased days for $34 each (plus taxes). The Bike Center is located next to the Adventure Center. 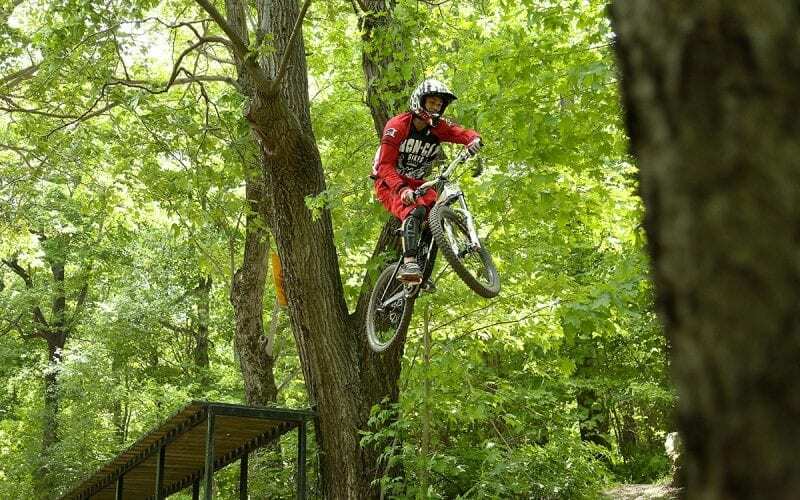 The shop features downhill gear and apparel, as well as a selection of other biking necessities. Need a Bike? We’ve got you covered. Our shop is equipped with some of the best downhill bikes available. When we say you’re in good hands if you don’t have your own bike, we mean it. Half Day 10 a.m. - 2 p.m. or 2-6 p.m. Please note that a limited number of Downhill Mountain Bikes are available for rent. It is suggested that you contact Adventure Reservations at 800-452-2223, ext. 7997 to reserve your bike prior to your visit. Downhill Bike rental rate includes full face helmet. Body armor rental is available for an additional charge. 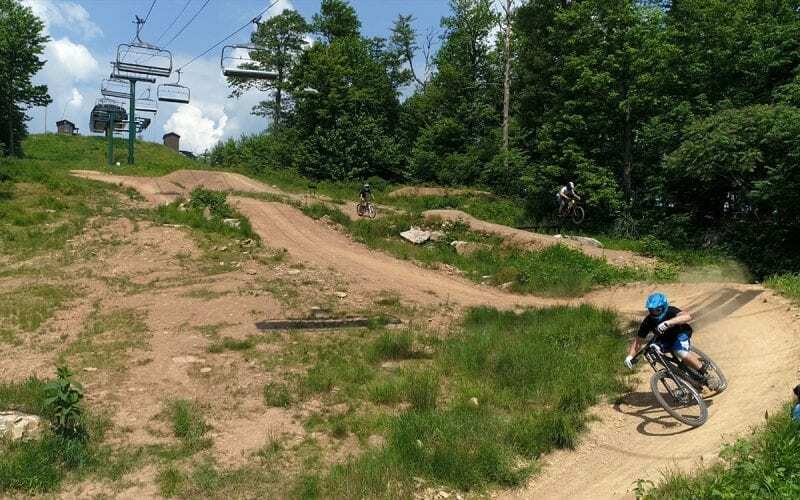 Before you begin to explore the lift serviced downhill mountain bike terrain at Seven Springs consider taking a lesson. Our bike professionals are here to make sure you have a fun, safe and memorable experience on our trails. 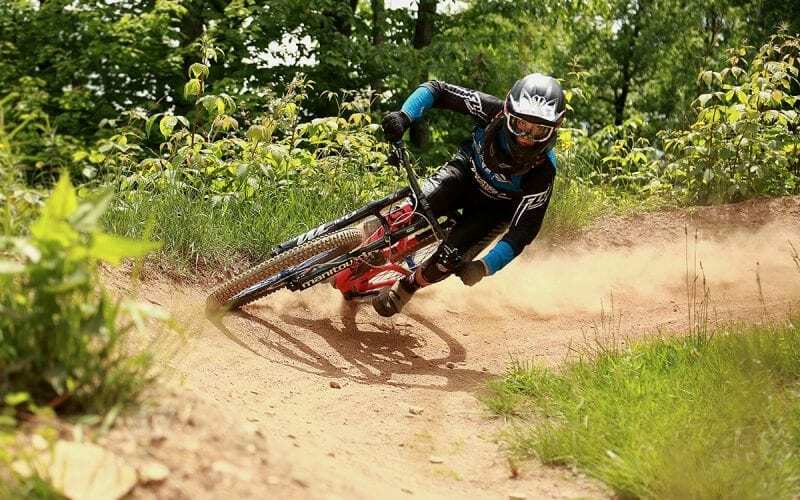 We now offer Downhill Mountain Bike Lessons for Beginners, Intermediate and Advanced Riders. 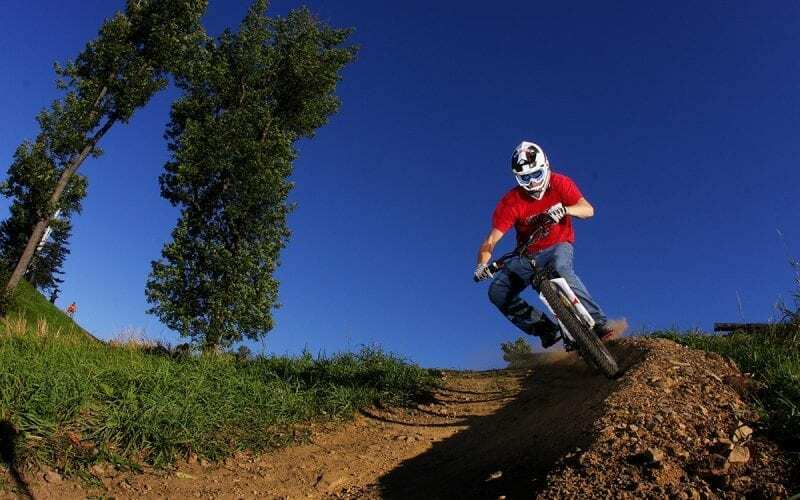 Our Downhill Biking Lessons will cover the following areas for each lesson level. What bike is right for the ride you would like. How protective equipment should fit. Basic controls of the bike and ways to change the characteristics of the bike. Tuning the set up of your bike for the trail you are riding. Two-Hour Instruction: Park Ticket, Bike Rental and Gear are not provided. 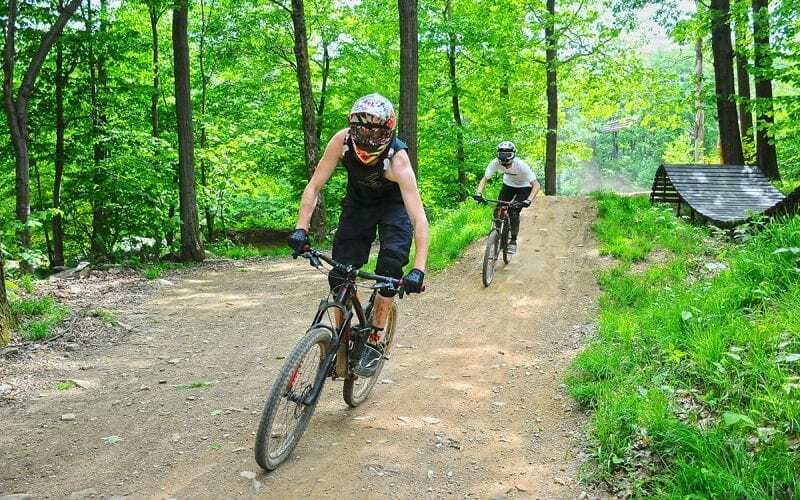 Two-Hour Experience Downhill: Includes Two hour downhill bike rental, trail access ticket, protective gear and guided instruction. After your lesson you can rent your bike for half the day for only $25 more! 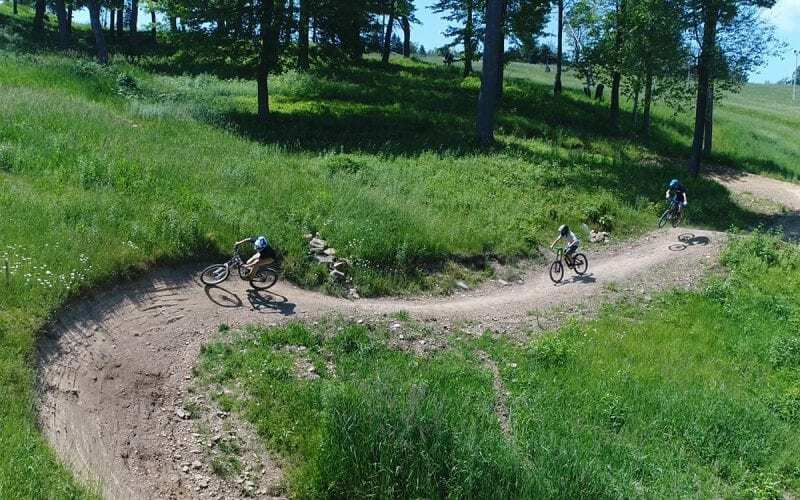 Two-Day Downhill Experience: Includes Two days of two hour downhill bike rentals, trail access tickets, protective gear and guided instruction. 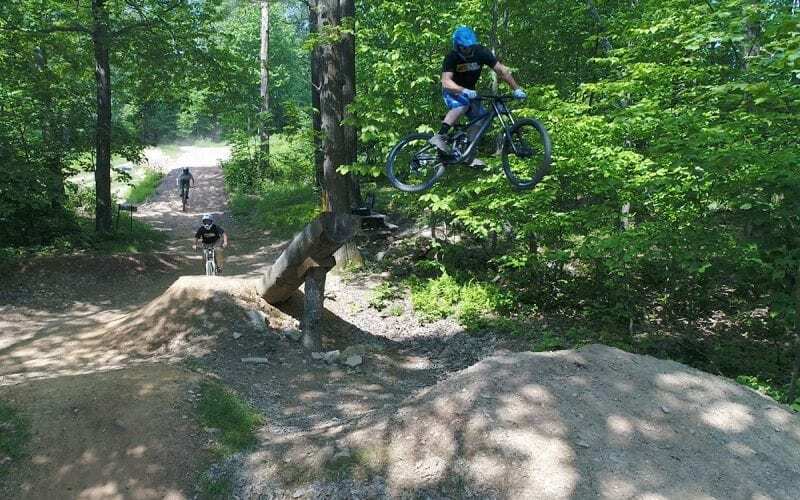 Explore the park’s lift serviced downhill mountain bike terrain and experience flowy and exciting trails packed full of berms, banks, rock gardens, drops, ladder bridges, table tops, boxes, fall line sections and 20+ foot jumps on the front and backside of the mountain! 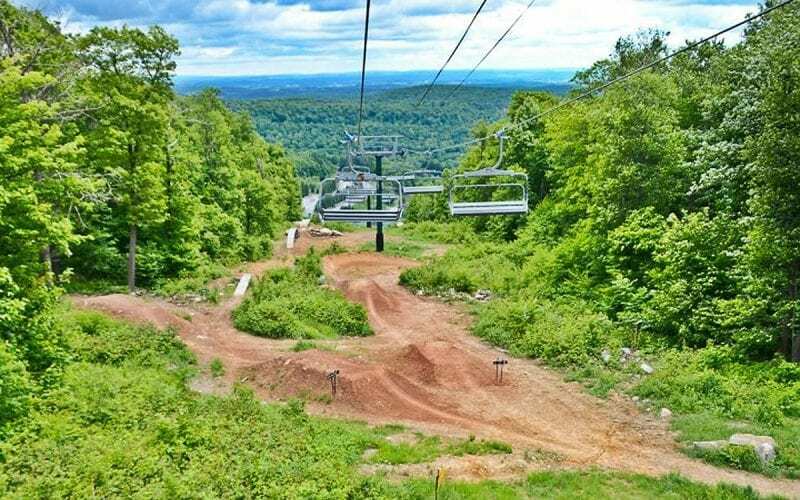 Serviced by the Polar Bear Express high-speed chairlift, the 18 Downhill Trails located on the Front Face of the mountain have something for all skill levels. 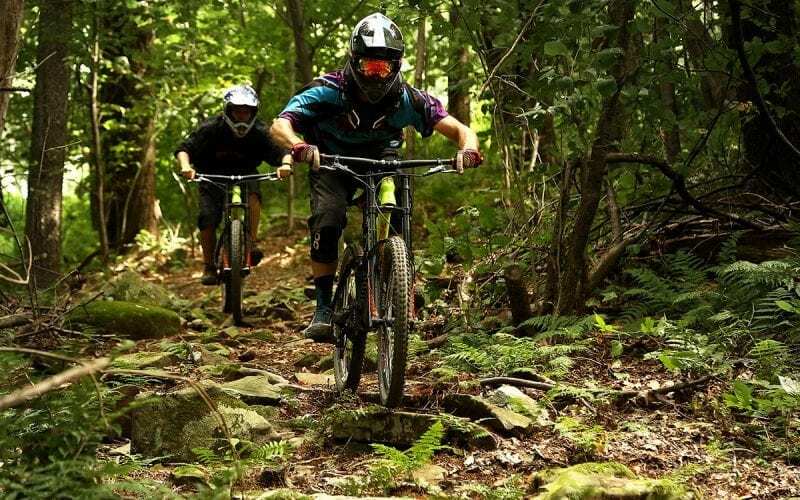 From the beginnger Rock and Roll to our advanced EC trails, designed by legendary mountain biker Eric Carter, downhill bikers are sure to find a line they want to ride again and again. If you mix up downhill features on a cross country trail what you get is some rock and roll. Rock n Roll dips your toes in the large pond that is our bike park. It features simple rock gardens, rollable wooden features, small rollers and jumps, and introduces berm turns. It is what it is… it's got rocks and rolls and it’s the best trail to discover what we've got or to wake up the legs in the morning before adventuring into the rest of our trails. Our bread and butter, your best friend, and the first trail that opened the doors over a decade ago. 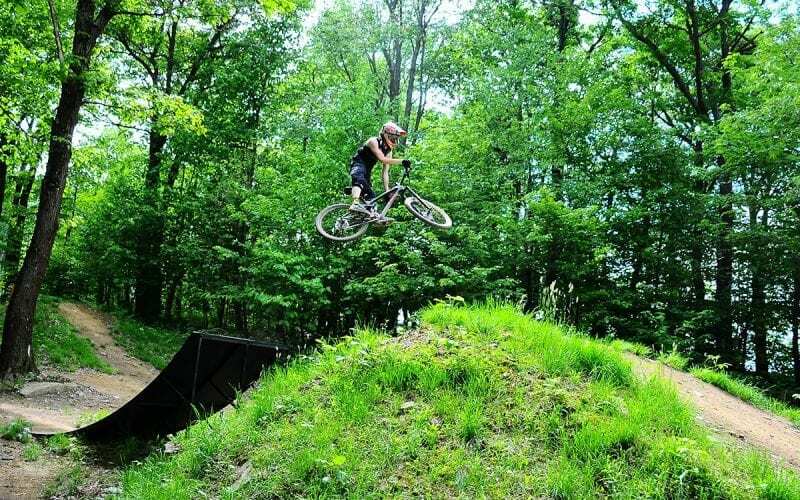 This intermediate flow trail is machine built with berms and rollable table top jumps the whole way down. This trail can be ridden at many speeds and can be enjoyed by everyone. With its wide dirt surface and lack of rocks and roots this trail flows. Revamped in 2018 this section of trail winds back and forth with large cut berms and airable rollers as it takes you into Helen's Woods. It is accessible from 007, Super Connector, Secret Stache, and Upper EC1. Make sure you save some energy for the bottom because its not over yet. 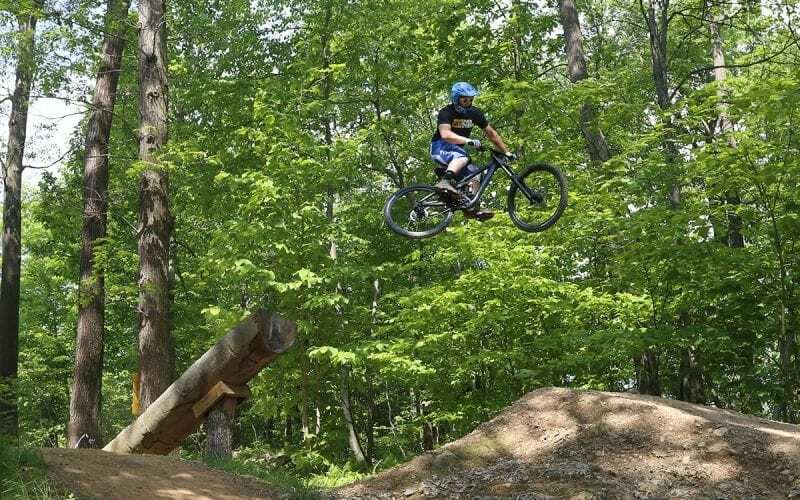 Helen’s Woods is an elbow tucking backwoods line with tight trees, a launchable rock take off, a techy rock garden and swooping turns to spit you out into Showtime. 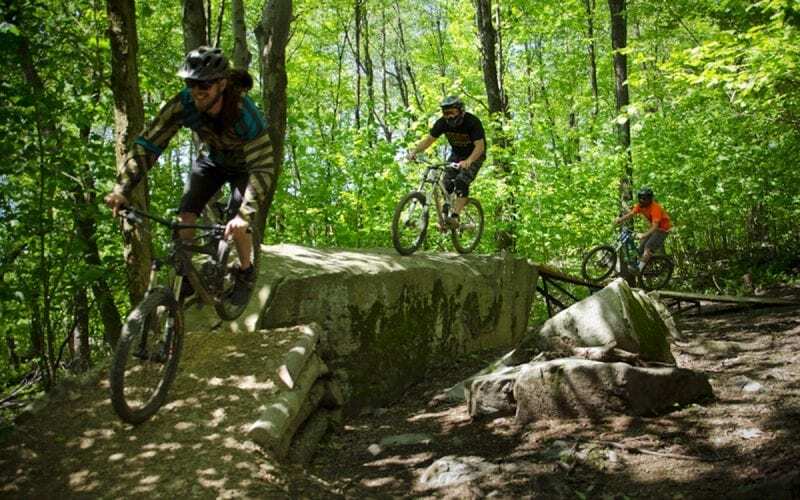 This trail was designed by Mountain Bike legend Eric Carter. It has the best of everything from Large Jumps, Rad Rock sections, tight twisty berms, and Steep Rock drops. It's mix of high level technical riding and fearless speed is an absolute blast. Slopestyle anyone? Moto Ramp, Cannon log, Rainbow Bridge, Dirt transfers, and Step on and off wood features are whats waiting for you on these two. These trails are is packed with air time. Built by a former Santa Cruz pro rider and red bull rampage designer, one of the best Randy Spangler . I hope you like rocks because this trail has every shape, size and flavor. After exiting the Arena you are instantly faced with difficult decisions in speed and line choice. This trail ends in a dandy of a rock drop that you can hit at medium to high speed before sending you into the berms of the glades. Think big hit features layed out in a line for you. This Trail takes you from the Arena to 007 at an adrenaline pumping level. Featuring Mustache rock and the Stache drop this trail is a great section to line up one of the best runs in our park. When your tire treads hit this trail section, you’ll know why the name couldn’t be better. It’s literally Showtime! Throw your skills down here and impress your lady watching from the crowd. Come steaming out of Helen’s Woods and pick your line. Not for the feint of heart these two trails are old school beasts. Mostly hand made these trails are technical and steep riddled with rocks roots, and shoots. Its just that....Peel off 007 and get fired into EC1 this tight swooping section will have you wondering how fast you are really moving. 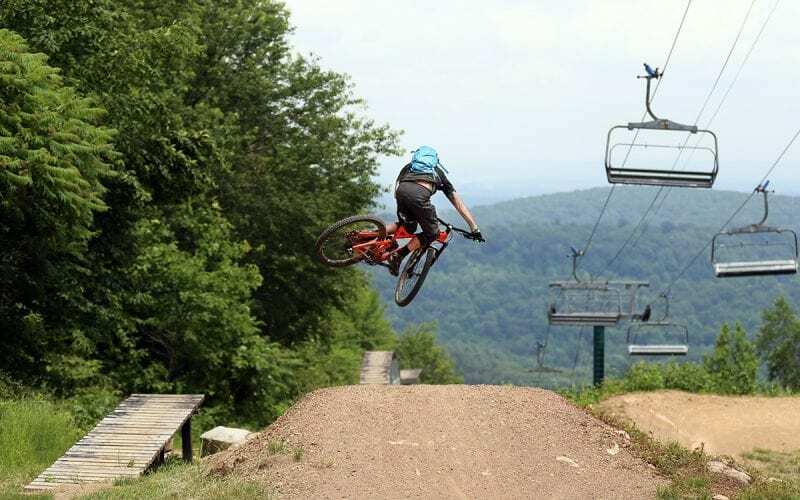 Serviced by Gunnar high-speed chairlift, the trails open an entirely new area to the bike park, adding more than three miles of trail and a significant increase in vertical drop. 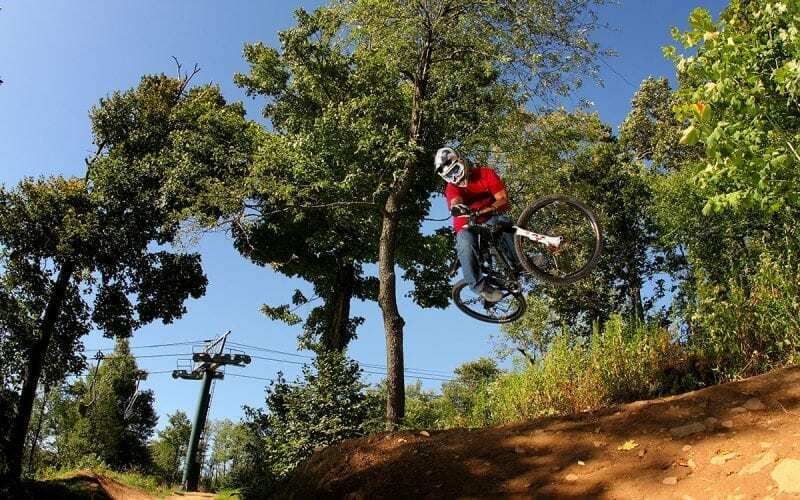 The existing downhill bike park has a vertical drop of 452 feet, while the North Face area boasts 750 feet of vertical. 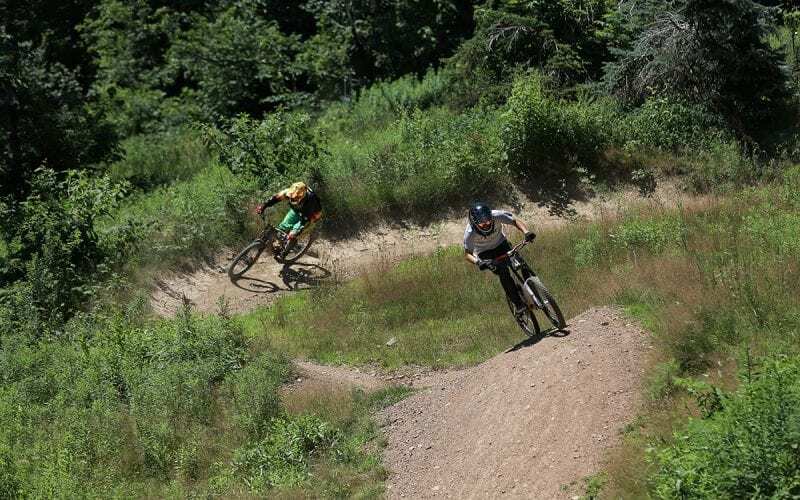 The North Face Downhill Terrain trails are designed to cater to all skill levels. This trail gives you one of the longest rides on our mountain. The start of the trail gives way to some fantastic scenery as you roll across the top of the North Face of Seven Springs. 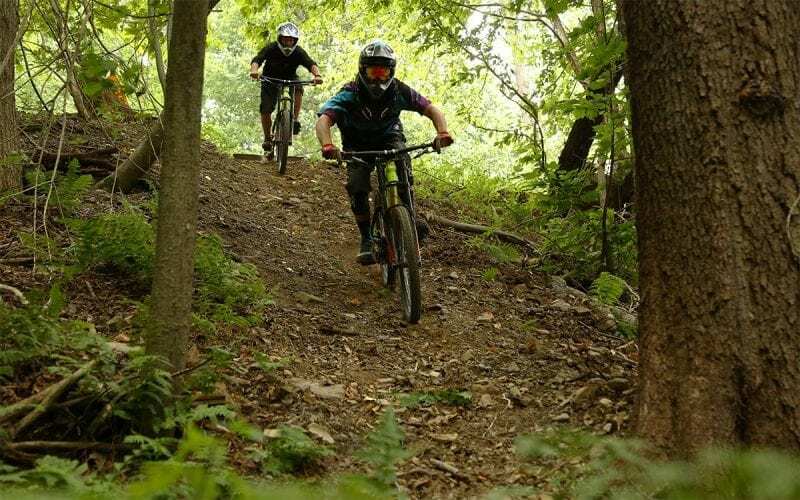 Once you head into the woods you are met with a high-speed descent that will put you into fighter pilot mode as the trail dips and swoops to the bottom of the hill. This trail is not for the faint of heart... Prepare to drop in! A steep, technical descent with tight shoots, loamy soil and rock gardens, KT7 was built using limited man-made features and machinery. 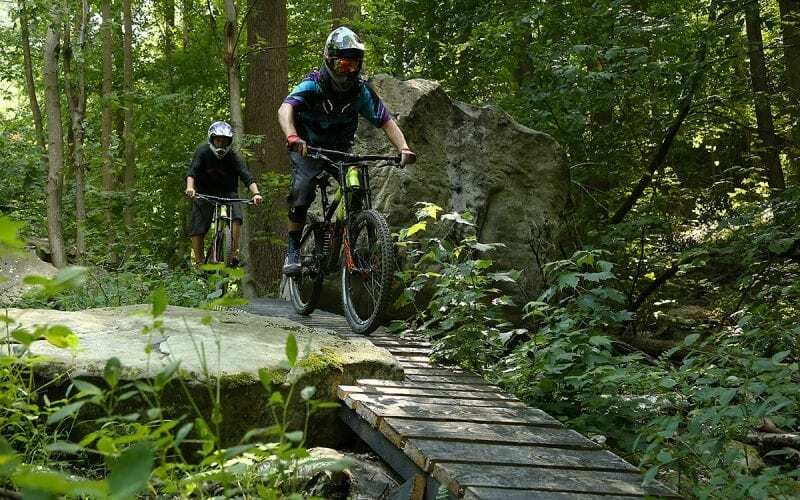 Built almost entirely by hand, this trail will take you back to the roots of downhill mountain biking. The Camp3 Trail is our newest trail completed in 2018 for our inaugural CAMP3 Cup race! While this trail has tremendous steeps it has a variety of line choices that will keep you coming back for more. 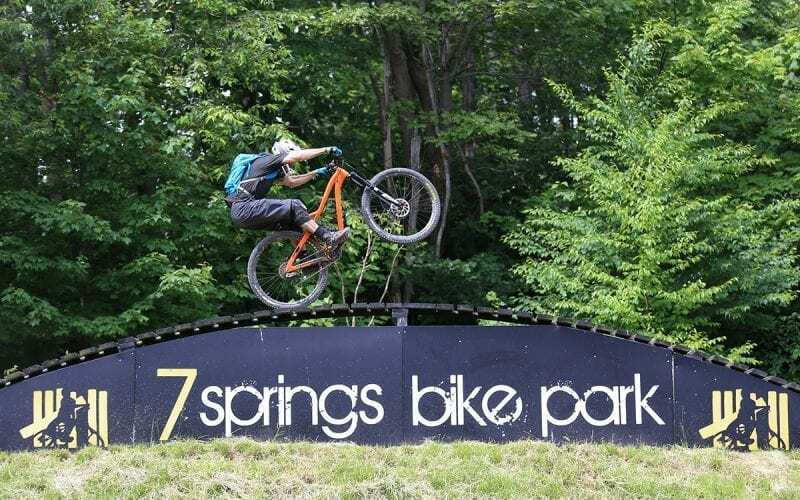 The Seven Springs Bike Park is a much different experience from cross country riding. The trails require constant physical and mental effort in order for all riders to maintain safe control. Bike Park Safety, Age Policy, and More! No one, under any exception, under the age of 8 is permitted to ride the course. 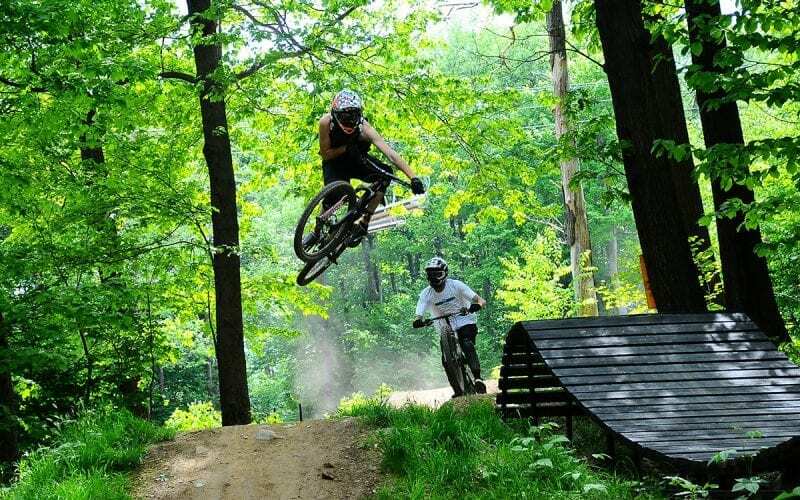 Guests ages 8-11 must be accompanied by an adult or legal guardian at all times while utilizing the Downhill Bike Park. Guest ages 12 and older are not required to have an adult or legal guardian accompany them while in the Downhill Bike Park. Any person under the age of 18 must have a parent or legal guardian present to sign a Downhill Mountain Biking release and liability form. Helmets are mandatory for all riders. The best protection from abrasion requires a properly fitted full-faced helmet, gloves, long pants, long sleeves, shin pads and elbow pads. 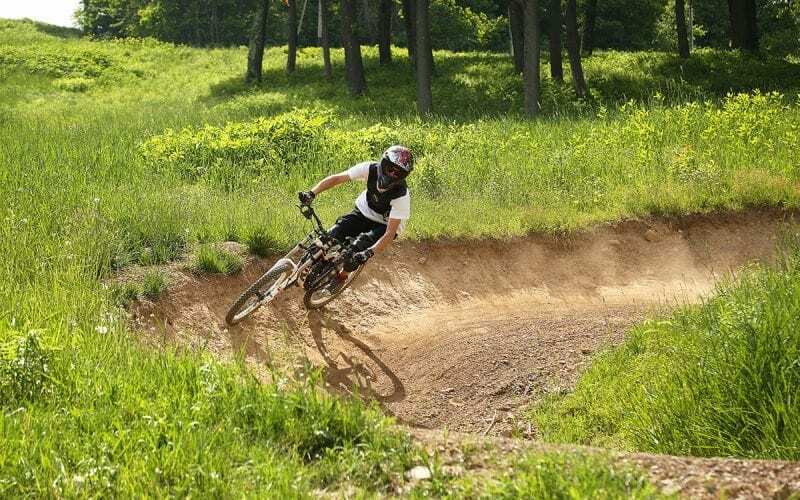 The Bike Park trails are specifically designed for full suspension mountain bikes. The trails are rocky, bumpy and become much more difficult without high quality suspension. Without full suspension, fatigue becomes a factor much sooner. The steep grades necessitate disc brakes for adequate stopping power. Cantilever brakes will increase fatigue as more effort will be required to maintain control. All riders should ride a properly sized bike and should be able to stand with both feet on the ground without their seat touching them. A bike that is too large or that has a seat in high position can increase chance of injury. The level of risk increases with the level of difficulty. Black trails often have larger drops and jumps that require skill and experience to navigate through. 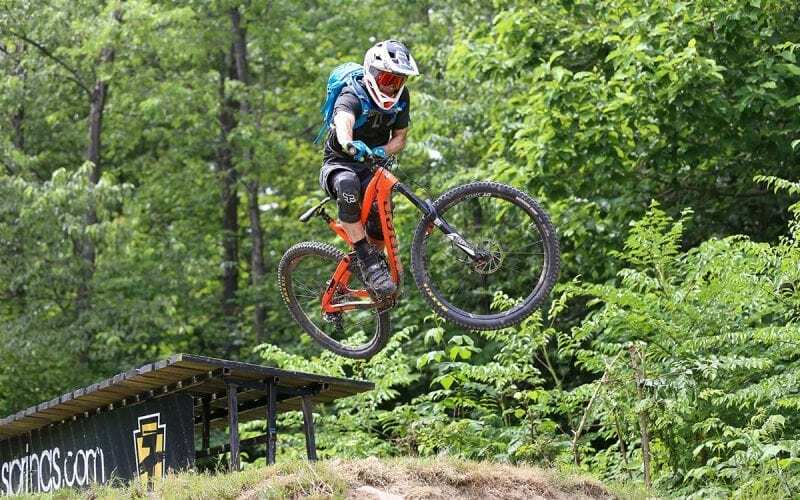 Seven Springs Bike Park has a filter feature at the top designed to keep riders with insufficient skills off trails that exceed their ability. Younger riders become a hazard to other riders if they are unable to ride a trail or move out of the way. Children should be accompanied by an adult at all times. Bikes are permitted on the Polar Bear Express. Boarding the lift requires significant strength when loading a bike and children may require assistance. Riders have two options when boarding our lift. They can either carry their bike or have the attendant hang it appropriately on the chair behind them, where they can pick the bike up at the top. If you have any questions, please let us know and we will put you in contact with our Bike Park Staff.